Jack Fellows Hand Signed and Numbered Limited Edition Print on Paper: "DevilBoat-PT191"
About the Artist: Devil Boat was the term the Japanese used when referring to the fast Patrol-Torpedo boats that wrought nocturnal havoc upon their barge supply line traffic in the SW Pacific Area of Operations. 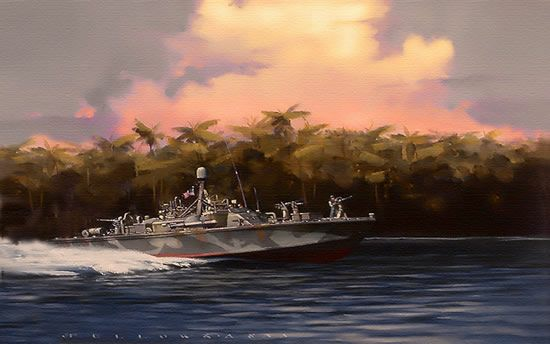 The painting depicts Rumsey Ewing's PT-191 as it heads out in the evening from its base in New Guinea. The 80' ELCO Motor Torpedo Boat was the definitive design for this Theater of operations.